The Umatilla Morrow Radio & Data District is authorized to acquire, maintain, and upgrade the voice and data communication system used by local agencies that include police, fire, and medical service within Umatilla and Morrow Counties and the Confederated Tribes of the Umatilla Indian Reservation. The District also supports interoperability with state and federal agencies. The boundaries of the city of Milton-Freewater are not supported, as this jurisdiction elected not to be included in the District. The system was constructed with funds provided by federal grants associated with the Chemical Stockpile Emergency Preparedness Program (CSEPP). The funding ended in May 2012, after the United States Army completed the demilitarization of chemical weapons at the Umatilla Army Depot. Before the CSEPP system was installed, local user agencies built their own small, separate communications systems. At the time of the district’s formation, most of these standalone systems no longer existed or had become obsolete due to technological advances and federal requirements. Today, these agencies have a reliable, effective, and efficient means of communicating within their departments and with other agencies in the district. The ability to form a radio and data district was created in 2009 when the Oregon Legislature passed and Governor Kulongoski signed House Bill 3254, which added ORS 403.500-403.542 Radio & Data Districts to the Oregon Revised Statutes, in May 2010 funding was approved by a levy on the ballot in November 2010. The District is funded by a property tax of $.17 per $1000 of assessed value for those residing within the district. Voter approved taxing authority ensures a fair method of stable funding for a critical service that supports multiple jurisdictions. The organizational structure of a Special District provides strong, effective governance with local oversight and representation. 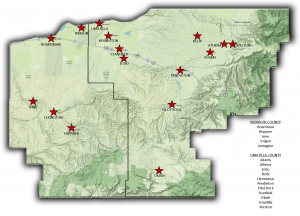 Umatilla County contains 3,231 square miles and a population of 75,889 in twelve cities and unincorporated areas. The assessed value in 2012 was $4,358,483,353. Morrow County contains 2,047 square miles and a population of 11,173 in five cities and unincorporated areas. The assessed value in 2012 was $1,574,354,332.